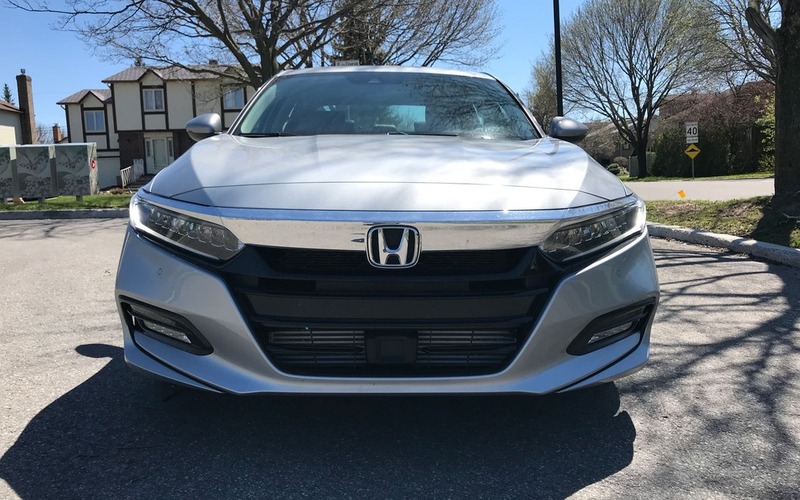 The all-new, tenth-generation Honda Accord has arrived and it’s sure to make some waves in the traditional (albeit dwindling) midsized sedan market. Canadian consumers have indicated their preference in buying crossovers and SUVs en masse for years now, with the top four midsize sedans experiencing sales declines. Ford has thrown in the towel and will retire the Fusion next year, after their 2017 sales were down 32% compared to 2016. The Chevrolet Malibu experienced a similar 29% drop in sales, but is still hanging in there. The Accord and Camry are going to be duking it out for the #1 spot this year. Honda has gone to town on this Accord with a completely new design from the ground up. It has a lighter and more rigid body structure, a new chassis, two all-new, high-torque, direct-injected and turbocharged engines, the world’s first 10-speed automatic transmission for a front-wheel-drive car, new safety, driver-assistive and connected-car technologies—all wrapped in a sleek and athletic design with a focus on interior space and comfort. The exterior sports Honda’s new design language along with a different silhouette that will ensure nobody confuses it with the previous generation. “That’s an Accord?” was a common phrase levelled at me during my time in the test vehicle. The wheelbase is longer (+55 mm) but the body is shorter (-10 mm), wider (+10 mm) and lower (-15 mm) than before. The nose is long and pronounced, and includes nine-lamp full LED headlights and LED fog lights. The rear taillights have become somewhat scissor-shaped, but give it an edge that was lacking before. Plant yourself inside and you’ll immediately be impressed with what the engineers came up with. The materials are of the highest quality and would fit right at home on many luxury vehicles, including brushed aluminum, wood and soft leather. The overall design and layout is highly functional and comfortable at the same time. The pushbutton gear selector creates more room than your traditional shift lever and looks nice to boot. The beautifully designed steering wheel has all the right controls in the correct places and feels simply amazing to the touch. Knobs for climate and volume are (thankfully) present giving the driver total and immediate control over all vehicle systems with ease. A head-up display system gives you speed information without taking your eyes off the road. 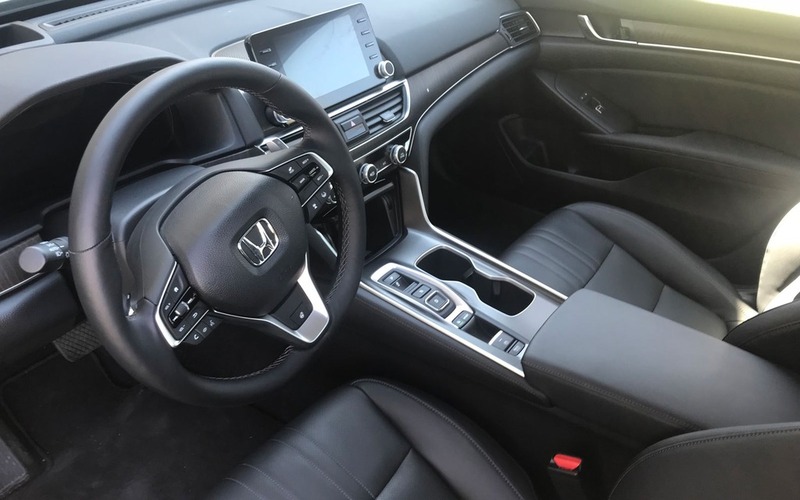 The Accord features a seven-inch TFT driver’s information cluster and a new eight-inch infotainment touchscreen interface. The system is adequate, though the menus could use a little de-cluttering as they aren’t very intuitive. Apple CarPlay and Android Auto give phone junkies all the functionally they desire along with two USB ports and wireless charging. The interior just works well in every aspect. The cupholders are where you need them, the buttons are all within reach, the seating position is good, visibility is good and it’s pleasant to look at. Honda has done a fantastic job of creating a space that you don’t want to leave. It’s also extremely spacious inside both in front and in the rear. Tall adults will have no issues entering and exiting the Accord. There are plenty of handy storage spaces for all your family’s nicknacks or food which will accumulate on long road trips. Two engines are available for the 2018 Accord. The new 1.5-litre, four-cylinder turbo produces 192 horsepower as well as 192 lb.-ft. of torque from 1500 to 5000 rpm, up from 185 horsepower and 181 lb.-ft. on the previous 2.4-litre model. It can be mated to a continuously variable automatic transmission (CVT) with G-Shift control, or a six-speed manual transmission. The second engine is a new 2.0-litre turbo paired with a 10-speed automatic or an available six-speed manual. This new mill, sharing much of its design with the race-bred Civic Type R’s engine, produces 252 horses at 6500 rpm as well as 273 lb.-ft. of torque from 1500 to 4000 rpm. The test vehicle had the latter and hauled the sedan plenty when pushed. The ride is a clean balance between comfortable and athletic. The Accord can take corners with prowess and absorb potholes without jarring the cabin. Braking is stellar and among the best I’ve experienced in a sedan (luxury or otherwise). The test vehicle was equipped to the fullest and consequently has a high sticker price to go with it. The Accord Touring with the 2.0-litre engine will start at $38,890 before freight and dealer prep, which will push it past the $40K mark. That’s quite a bit of coin for the Accord, but it does deliver on just about every aspect to back up the price. If it’s too much, you can work your way up the ladder starting with the base LX model at $26,590. 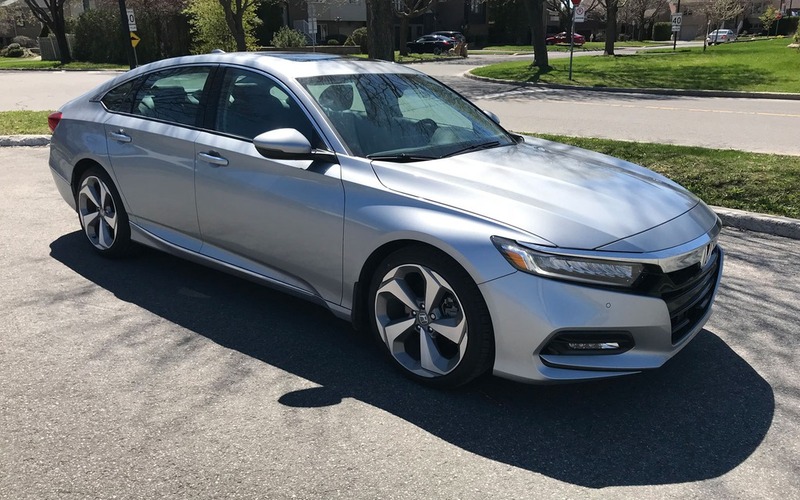 The 2018 Honda Accord is a fine package that needs to be tested before any final decision on buying a midsized sedan. After ten generations, Honda has engineered an Accord that may actually convince crossover buyers to think twice before pulling the trigger. 8/10	Excellent for a vehicle this size. 8/10	Quick and peppy with great handling. 7/10	Gets the job done, but could be better. 9/10	A pleasure to drive. 8/10	Very good product all around that could become the top seller in its class.